The Battle of the Somme or the Somme Offensive was a series of battles that occurred during the Summer and Autumn of 1916. It involved British and French forces launching a massive offensive on the German lines to break the stalemate on the Western Front. The Battle was primarily a battle between the Germans and the British. The offensive was not effective and achieved very little for the allies. The British only advanced a few miles and the German lines held. The offensive did not break the stalemate and resulted in massive causalties for both sides. Historians have argued whether the Somme was a failure or a partial success. It is clear that the British and French did not secure their main objectives during the battle. Why did the Somme offensive fail to achieve its planners’ primary goals? Mostly, the Allies failed at the Somme because of poor leadership, planning, and a stubborn German defense. Since 1914, the war on both the eastern and the western front had become a war of attrition. Both sides had established a series of defensive lines, involving thousands of miles of trenches and they regularly attacked and counter-attacked each other for little or no strategic or tactical advantage. The western military and the governments were eager to end the war or at least to be seen as delivering a victory. There were concerns that the public would not tolerate a war indefinitely. The resources of France and Britain had become stretched, and they needed a victory to demonstrate that they were winning the war to their public. There was a genuine desire to end the stalemate which was costing thousands of lives per week. Then there was the strategic situation on both the eastern and the western front. The Russians had been planning their assault on the Austro-Hungarians in the east, an attack from the west would mean that the Germans could not come to the aid of their allies in Vienna. Then there were the almost simultaneous massive battles taking place in Verdun. The Germans and the French were engaged in a bloody battle for the fortress of Verdun. The French army had found itself hard pressed and many feared that they would break and this could result in the Germans driving a wedge between the British in the north and the French armies in the south. The Somme was seen as necessary to alleviate the pressure on the French and to assist the Russian offensive. General Sir Douglas Haig assumed command of the British army in early 1916. He wanted to launch the offensive nearer the English Channel to be closer to the British supply lines. However, the French pressured the British to have the offensive in the Somme region. When the Verdun offensive started the Somme area saw the withdrawal of many German units. The Germans had little reserves in the area, and it seemed that the Somme was the perfect location. The Anglo-French attack was to break the German lines and achieve a breakthrough that would allow the allies to drive a wedge between the Germans armies in France. 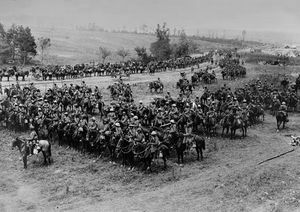 The British after a five-day bombardment was to launch a massive infantry assault; once the Germans had fled from their trenches, the British cavalry would push forward and seize key objectives such as railroads and bridges in the Somme. However, the British had failed to understand the nature of the German defenses on the Somme. They had added a third line of defense, had established a telephone system and had dug even more trenches. The German defenses did have some deficiencies, but they proved to be formidable. The British underestimated the German defenses, and this was to prove costly during the coming battles. Many of their reserves were transferred to the area. They stationed thousands of artillery pieces in the region. These were expected to play a crucial role in the coming offensive. The British leadership believed that a concentrated artillery barrage could either force the German defenders to flee or destroy their defenses. Crucially, the British had not mastered the tactic of the creeping barrage. This tactic would have allowed the infantry to advance under cover of shelling. The British failure to do so meant that when the artillery barrage ended that the Germans who survived the artillery onslaught could mow down the advancing soldiers with machine guns. New military technologies were also employed at the battle of the Somme. The British intended using airplanes and tanks in a major battle for the first time.. They gave the British more capabilities. The tanks could be sued to punch through the German lines, and the airplanes could gather intelligence on the movements of German troops. However, the British High Command was to fail to use these new weapons effectively. The planners at the Somme also expected the infantry to make spectacular gains. The common soldier or ‘Tommy’ was expected to take trenches using only his gun, bayonet and grenades. The British High Command was simply expecting too much of their soldiers, especially given the heavy and sophisticated German defenses. The inability of the British to properly employ and coordinate their forces and their unrealistic expectations was to cost many soldiers their lives and to limit the advances made during the offensive.. The first day of the Somme offensive started after the five-day barrage had ended. For five days the British had blasted the German lines. Hundreds of thousands of shells landed on the German trenches. The British believed that they had obliterated the German defenses. On the first of July the British and the French ‘went over the top’, that is they left their trenches and entered into no man's land. The British were ordered to advance at a walking pace. However, some officers on the ground ordered their men to rush across no man's land. The British failed to take many German trenches and instead suffered catastrophic casualties. The order to advance at a walking pace over no man's land probably cost many brave men their lives. The first day on the Somme was also the worst day in the history of the British army, it suffered almost 60,000 casualties, mainly on the frontline between the Albert–Bapaume road and Gommecourt. The French did achieve some significant results, and they ejected large elements of the German 2nd Army from their positions south of the Somme. The British in total only made minimal gains at a considerable cost. It was clear after the first day that the British had not achieved tactical surprise and that the German defenses were stronger than expected. However, the British and the French High Command continued with the offensive. 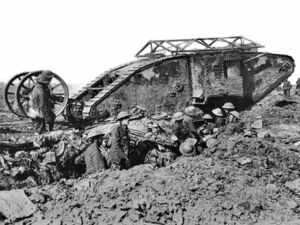 The Somme offensive was to become a series of set pitched battles mainly between the British and the French. Historians had identified some thirteen significant battles between the Anglo-French armies and the Germans during the Somme offensive. The British were on the attack all through the summer and the early autumn. 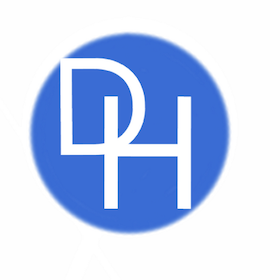 The Germans mainly adopted a defensive posture. They mostly stayed in the trenches and waited for the British to attack. The tactics of the first day of the Somme was repeated again and again with only limited results. The Germans did not have the reserves to stage any counter-attacks during the offensive as they needed all their men for their siege of Verdun. The British introduced tanks to help them break the deadlock, but they proved unable to coordinate their advance with the infantry. Furthermore, the tanks proved unreliable and often broke down. The fighting continued until early November when the onset of winter and especially the rain meant that the British could not simply continue. The Somme was one of the bloodiest and perhaps least effective battles of the war. The estimates for casualties are inexact and only educated guesses. The British and French suffered approximately 600,000 killed and wounded. The Germans suffered about 500,000 casualties. The Anglo-French armies did manage to make real and significant gains, especially after the initial phases of the offensive. At the end of the battle in November, the British and French forces had penetrated some 6 miles into German-occupied territory. 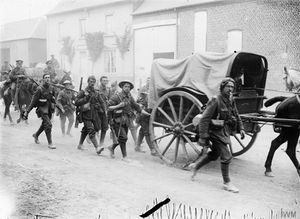 The offensive had recaptured more than any other battle since the Battle of the Marne in 1914. However, they had failed to take many of their objectives such as Peronne and Bapume. It could be argued that the Battle of the Somme did not end as the British resumed their attacks in the area in 1917. The Somme did not deliver a death blow to the Germans; they were forced back to their second and third lines of defense. They had retreated in good order, and they had been able to maintain their lines, and there was no general Allied breakthrough. However, the only benefit to Allies was that they caused 500,000 German casualties because the Germans suffered such significant losses and it may have contributed to their eventual collapse in 1918. This contention is debatable because Germany was able to move a significant number of troops to the Western front after Russia's collapse and replenish the front lines. The planning for the Somme offensive was rushed. Haig had only been in his role since the previous December. He wanted the British army to attack further north but political considerations meant that he had to heed the opinions of the French. The planning was accelerated because the British needed to come to the aid of the French at Verdun. Additionally, the British wanted to corrodinate their attack with Russia during their offensive. This meant that there was a failure to coordinate the British units effectively. Many have argued that the Somme offensive would have had a better chance of success if it had not been rushed. However, it was not only rushed planning that was a problem. The British High Command was guilty of being over-optimistic. They had assumed that the British artillery barrage would be more effective than it was and they failed to take into account the fact that the Germans had been building extensive lines of defenses before the offensive began. Then there was the British planners’ failure to coordinate the various aspects of the offensive; they proved unable to coordinate the artillery barrage with the infantry’s advance. Furthermore, the British generals had been very conservative in their battle tactics, this can be seen in the orders they gave to walk across no man's land and their continued belief in the effectiveness of cavalry. If the British High Command had planned the offensive better, it could have been a true success instead of being at best only a partial success. Then there was the fact that the British High Command was reluctant to change the tactics they persisted using the same tactics from July to November and after the first day their enemy knew what to expect and planned accordingly. This meant that the Allies did not secure all their stated objectives. Furthermore, the Germans, although they had far fewer guns, had them organized in a very effective way in so-called ‘barrage sectors’ and this allowed them to inflict devastating casualties at the Somme. This was not expected, and that meant that the Allies did not achieve the breakthrough that they hoped. 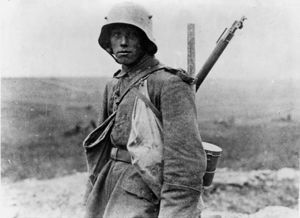 Then the German soldiers during the battle had been better prepared for example they did not find themselves loaded down with equipment like the British who had to carry almost eight pounds into battle. Furthermore, German units proved to be more flexible and could respond better to the dynamic battlefield situation. For example, the Germans proved to be able to adapt to the threat posed by the tanks and they found ways to disable and neutralize them. The Battle of the Somme was not the failure it is often portrayed. It did play an important role in the eventual German defeat in 1918 and did allow the allies to recapture some strategic territory. However, given the losses, the battle did not achieve much, and the Germans did not suffer any major strategic defeats. They proved capable of continuing the fight on the western front for another two years. The failure of the Allies to achieve their main objectives despite the massive losses was due to several factors, and they include poor and rushed planning. These meant that there were deficiencies in the planning process and this hampered the allies advance. Then the Germans proved adept in defending their positions, and they had established massive defensive lines. The British Generals in particularly placed too much faith in their new weapons especially their tanks and on the ability of artillery to dislodge and destroy defenders in networks of trenches. These all ensured that the Somme largely failed to be the decisive victory that its planners had hoped for in the Spring of 1916.